An extremely rare design showing a young woman either opening or closing an umbrella. She wears a rain-cape and high clogs ( geta ). 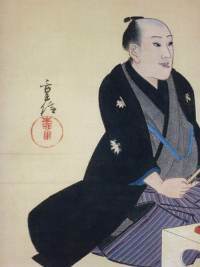 Toyonobu’s hashira-e are amongst his most accomplished works. There appear to be at least three other known impressions: A.D.Ficke, Chats on Japanese Prints, pl.8 ( ex Metzgor coll. ); H.C.Gunsaulus, Japanese Prints of the Clarence Buckingham Collection, Volume I, AIC, 1955, no.16, p.206; and James A. Michener, Japanese Prints, no.78, p.75. There is some confusion as the Michener example appears to be the same impression from various well known collectors and illustrated in different places ( eg M. Bullier collection, illustrated in V.& I, volume I-III, pl.LIII ). Wide hashira-e ( 27.5 x 5.5 in. ; 70 x 14 cms. ) Coloured by hand with beni ( overlaid with urushi ), yellow, mustard, brown and blue. Published c 1742 by Urokogata-ya. A beautiful print. Very good impression. Some toning ( as per usual ), and slight weakening along laid lines ( as per usual ). Trimmed slightly at left. The colours particularly well retained. Signed Tanjodo Ishikawa Shuha Toyonobu zu. A wide hashira-e ( 27.5 x 10 in; 70 x 25.5 cms ). Urushi-e, hand-coloured in beni, blue, yellow, mustard and lilac. 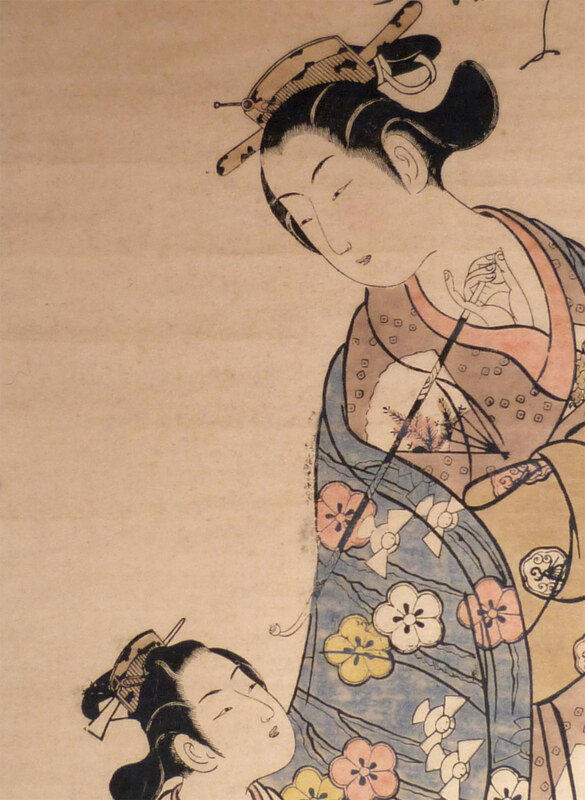 These early majestic Toyonobu prints are amongst the masterpieces of Ukiyoe. Of the utmost rarity: From a set of three prints of Beauties of the Three Capitals. 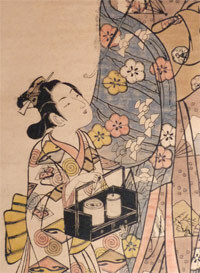 Sanpukutsui Keichu, “ A Set of Three: Within Kyoto.”The other two designs show women from Edo and Osaka. The only other impression is illustrated in the Bulletin of the Worcester Art Museum, April, 1915, p. 8. 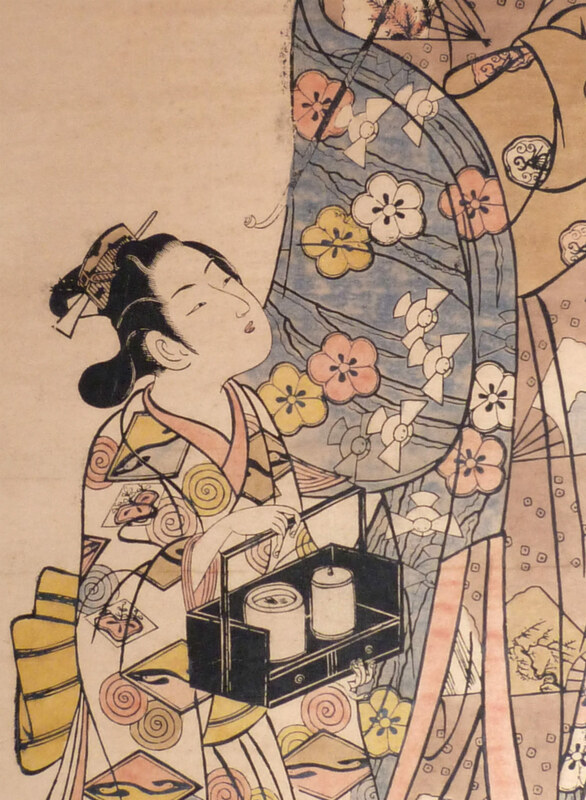 There is also a hosoban triptych of same subject by Toyonobu, c 1750s, in the Museum of Fine Arts Boston, accession number: 11.19672. This cheaper production follows the designs of the larger prints closely and was obviously intended to cash in on their popularity. Other similar designs were in the Vever sales, Sothebys, 26/3/1974 and 26/3/1975. 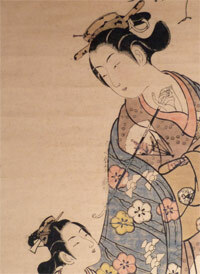 Shows a standing courtesan with a pipe, her acolyte holding her tobacco tray. Published c 1747 by Mura ( Murata-ya ) hammoto. Fine impression with extremely fine and delicate hand-colouring. Very slight creasing and very slight browning but otherwise in exceptional condition. Signed Tanjodo Ishikawa Shuha Toyonobu zu. Seals Toyonobu and Ishikawa uji.